In case you have been living under a rock (or just aren't as nerdy as me), the Olympic Track & Field trials have been going on recently over in the faraway land of Eugene, Oregon (aka Tracktown USA). There have been some upsets, some sweet victories, and some close calls. Thankfully NBC has been playing the coverage live on one of their stations. There must be some track nerds at the station or there are enough of us out there! I thought I would post some of my favorite highlights from the first half of the events in light of Olympic Anticipation! For full results, click here. 1) After coming in 4th place and being an alternate in the Women's Marathon Olympic trials in January, Amy Hastings (in the neon yellow tank top) went on to win the 10,000m in the track trials and secured her own spot on the Olympic team! Shalane Flanagan is a familiar face in this shot below. She came in 3rd and was using this 10,000m run as a tune-up for her London Marathon race. 2) Shifting gears to the men, a similar story can be found. Dathan Ritzenhein is the alternate for the Men's Marathon Olympic team, after coming in 4th in the trial. He also secured his spot on the Olympic roster after coming in 3rd in the 10,000m. Galen Rupp (1st) and Matt Tegankamp (2nd) also made the team. 4) The Decathalon is an event that intreagues me. Only the most well-rounded overall athletes are successful in this event. The 10 events that comprise this take course over 2 days. Day 1 consists of: 100m dash, long jump, shot put, high jump, 400m dash. Day 2 consists of: 110m hurdles, discus throw, pole valut, javelin throw, 1500m run. 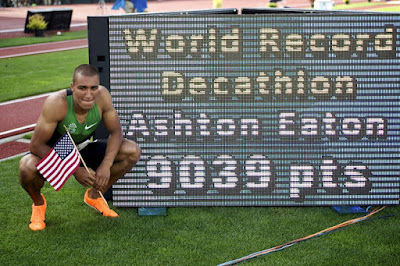 Ashton Eaton broke the world record in this event including some rainy conditions as well! I think these track trials in Oregon is great precursor for these athletes because it rains a lot in London! 5) After an injury took her out of the running for the Olympics in Beijing, Alysia Montano (middle with the flower in her hair) came back with vengeance and dominated the 800m race finishing in 1st place. She is famous for wearing a flower in her hair to accentuate her femininity while training with men when she was younger. It was a trend that stuck and is now her signature. she will be representing the US in the Olympics along side Geena Gall (2nd in the green jersey) and Alice Schmidt (3rd in the grey jersey on the far right). 6) The favorite to win the men's 800m was Nick Symmonds but there were a few wild cards in the mix too. Starting off in the back of the pack, Nick Symmonds kept pace with the group and didn't make his move until there were about 200m left in the race where he kicked his way to a strong victory. He is headed to London with Khadevis Robinson and Duane Solomon Jr. Duane (red jersey) led the race until the final 100m where he was outkicked by Nick (green jersey) and Khadevis (black jersey), but he ran a strong race and was overcome with emotion at the finish line that he had made the team. He shed tears and showed that it is okay to show emotion and have pride in what you've accomplished. Are you pumped up for the Olympics yet? The Track Trials are only half over! I'll be posting another update with my favorites from the 2nd half of the trials! If you're interested in more in-depth highlights on some of the other events, the RV Goddess has some great recaps and information. She follows track all year long so she can shed some more insights on these athletes than me. The source of all photos can be found here. I watched tonight, and it was amazing. The lady who won the 200m had the most beautiful stride. It looked like her legs were 9 ft. long. Haha, I know, right? I am pumped to blog about the 2nd half. 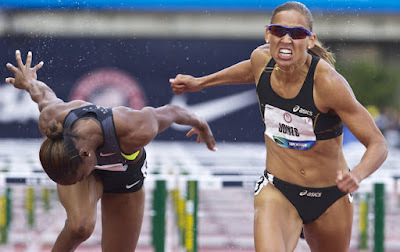 My favorite event by far was the women's 5000m. AMAZING stuff right there. We have so many talented athletes going out to support our great country. I'm so excited for London 2012! Like the appears of the exercise. If I'm to commence this, what for you think the approximate percentage of my 1RM must be utilised to the sets? Or ought to I be carrying out pyramids for weights, for example 1-2-3-2-1? cities that possibly have similar types of populations. If you're just searching for any excellent place to party then it's fantastic. If you're seeking for a boyfriend or husband, you'll be let down. thought this post was good. I don't know who you are but certainly you are going to a famous blogger if you aren't already ;) Cheers!